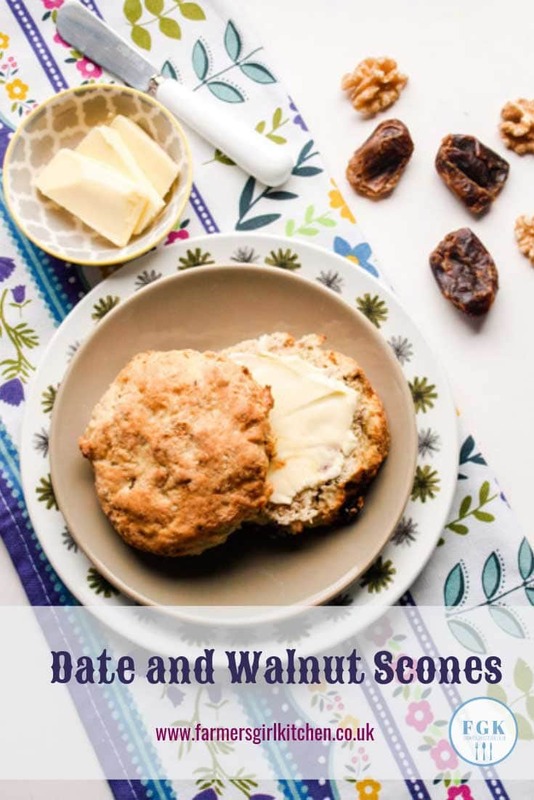 Date and Walnut Scones are a delicious sweet tea time treat and they are so easy to make you can have them on your tea table in 30 minutes. All they need is a little bit of butter because of the intense flavours of the dates and walnuts. 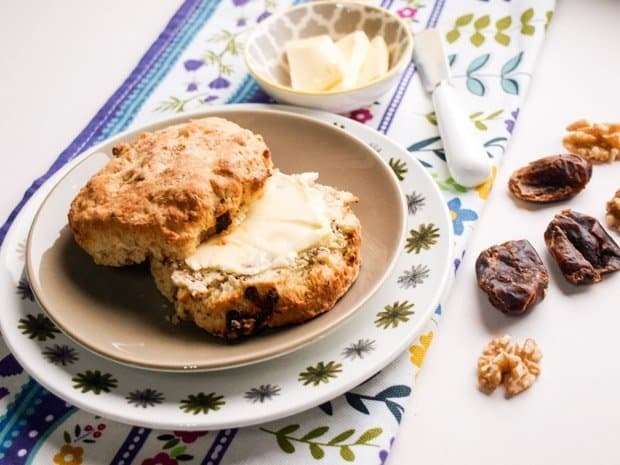 There are many different recipes and ingredients you can include in a scone, but I fancied date and walnut. 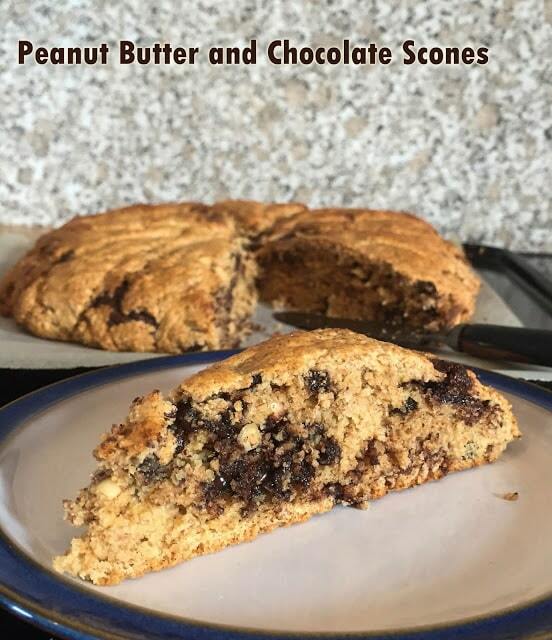 I scoured my cookbooks, but couldn’t find a date and walnut recipe, so ended up combining a couple of different recipes to create these delicious scones. If you are not a fan of dates and/or walnuts then don’t be put off, just change for other dried fruits like apricots, figs or raisins and use the nuts that you prefer, apricot and almond would be a great combination. If you can’t eat nuts, then just leave them out and add a little extra dried fruit. You can brush the tops of the scones with milk and sprinkle them with demerara or other large crystal sugar. It certainly makes them look pretty and is a nice touch if you are entertaining guests. You can also get more scones if you use a smaller cutter, but in our house BIG scones are popular and this bake was for home consumption only, so I didn’t top them with the sugar. 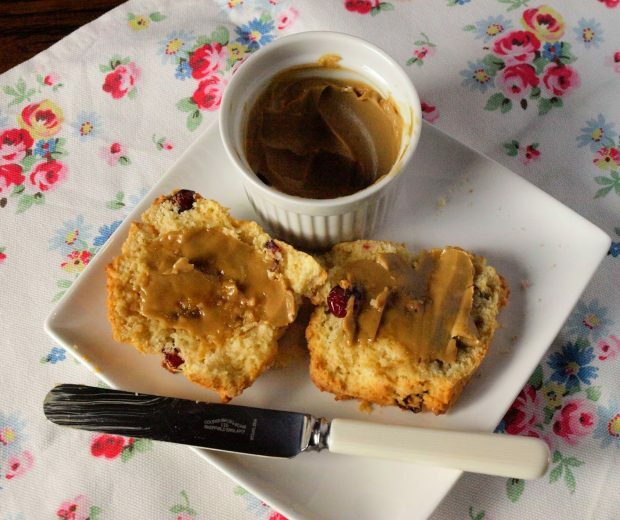 Light and delicious scones with added dates and walnuts, a real treat. Place the flour in a bowl with the baking powder and mixed spice, stir until well mixed, rub in the butter (or whizz in a food processor). Stir in the sugar, dates, walnuts and sugar. Roll out the dough and using a cutter, cut out 8 scones, re-rolling the dough if necessary. Place on a baking sheet, brush the tops with milk and sprinkle with demerara sugar. Bake in the oven at 220C for about 18 minutes until well risen and golden brown, Cool on a wire rack. They look lovely, Janice! I've never eaten dates before, but I can imagine the walnuts giving them a lovely deep flavour. I'm in the mood for making a big batch of scones now! Oooo ooo oooo, love dates!! 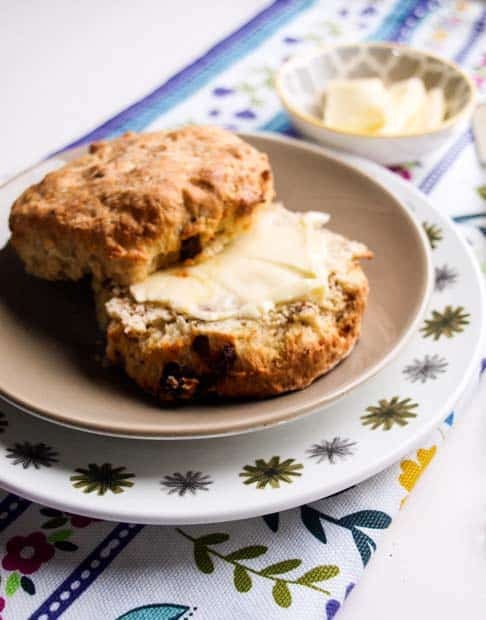 I have a date scone recipe– I clearly need to make it!! 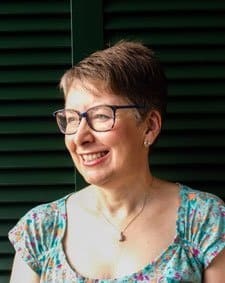 Oh your rubbing it in (pun not intended) the wounds of us heavy scone makers – easy indeed 😉 I'm just envious – your scones look lovely and sound really good with dates and walnuts too. 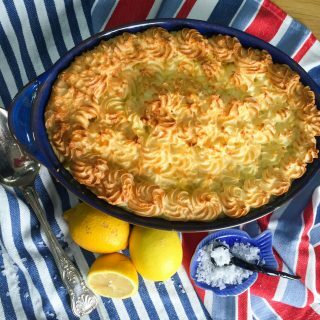 Halved amounts as trialling recipe but so wish I’d made full amount! The flavour is reminiscent of Xmas or fruit cake with the mixed spice a great background to the date & walnut. 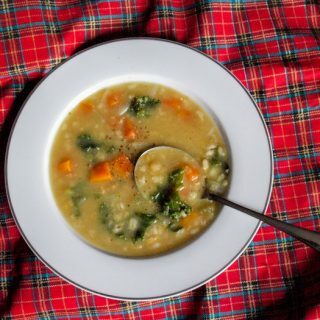 Lovely recipe – thanks. Oh I’m glad you enjoyed them, Ann. Date and walnut is such a great flavour combination. These are lovely and I’m struggling not to just them. The only problem I found was that I was never going to be able to roll the mix, even after adding more flour and I followed this to the g/oz. However this since going to stop me from making them again, they really are good. Thanks for the kind comments. I’ll check the recipe, as that doesn’t sound like it’s correct and there may be an error. Your scones look gorgeous, nicely browned and super appetising! 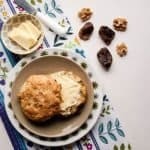 Thanks, Monika, we love all scones and Date and Walnut are especially good. 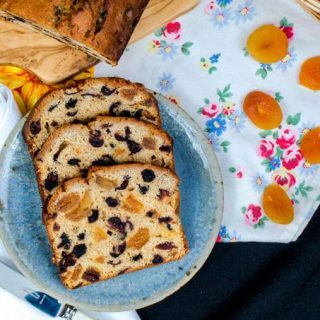 These look delicious – I may try apricot and/or candied peel and walnuts as I’m trying to avoid the very sugar-heavy dates! Yours look very light as well-not always a thing with a date and walnut wcone!!! Thank you and yes, do try different combinations, Carol. I’m a big fan of apricots too. I totally agree with both sentiments, Kat. Thanks, Eb. I also love the date and walnut combination. Date and walnut sounds good to me. I could devour one of these right now, with a big mug of tea of course! Thanks, Anna. A big mug of tea sounds good! What a great flavour combination! 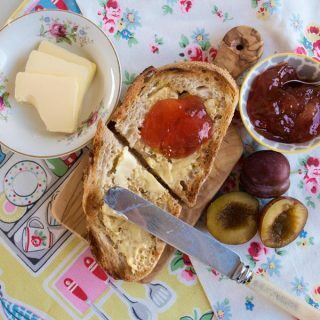 We are big fans of scones in this house and love experimenting with new flavours! Thanks Midge, I hope you try them ,they are really nice scones. I am a huge fan of scones but will admit I normally have them perfectly plain and serve with jam and cream. I love the idea of a savoury scone! Thanks, Emma, My husband still puts jam on these scones although they are quite sweet with the dates. 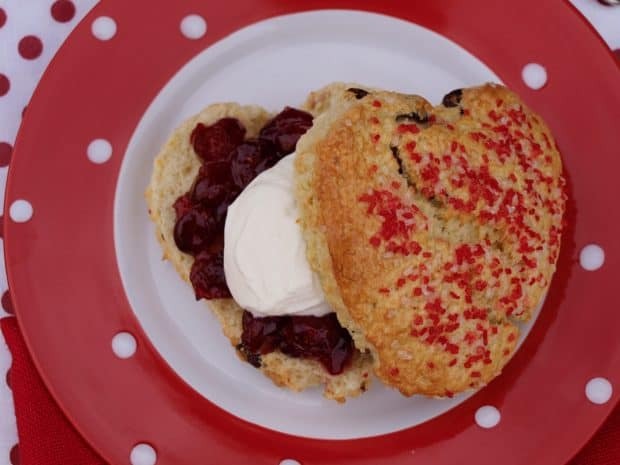 You can’t beat a good scone and these look absolutely gorgeous! Thank you, Nickki, we certainly enjoyed them. I aways forget how easy scones are to make and Mr R really loves them so I guess I had better make some soon! I know what you mean, Heidi. I seem to go through phases of making them then forgetting all about scones! Date and walnut is such a good combo, I think I’m in need of an afternoon tea! Thanks, I’m always in need of an afternoon tea! Oh these look amazing Janice! 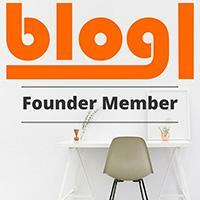 I love your photos they make me way too hungry! I just can’t stop admiring all the scones on this post, they all so delicious. 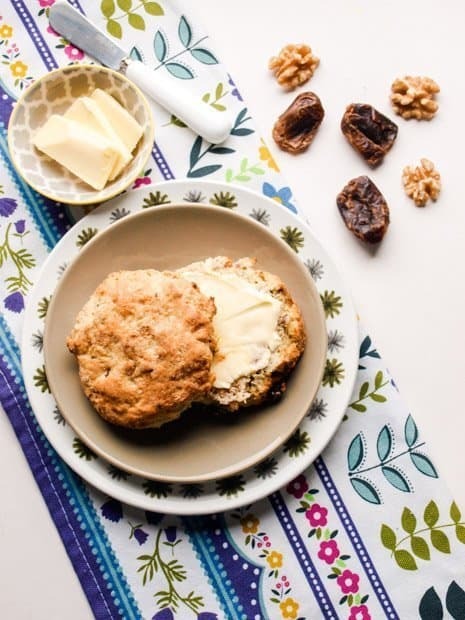 Love the combined taste of dates and walnuts and I agree with you one can add so many different ingredients to make hot scones for breakfast or tea. Thank you, Mayuri. 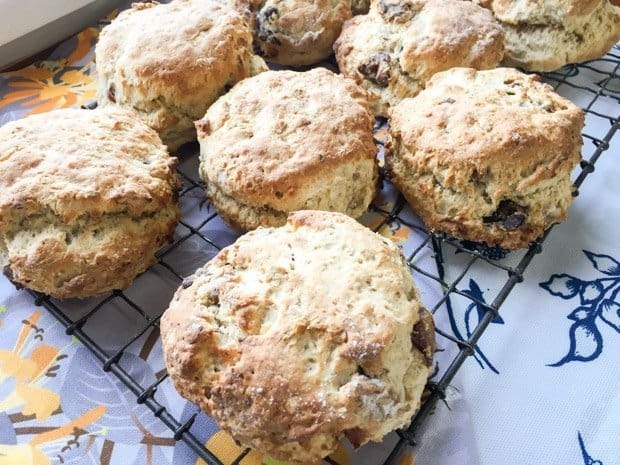 Once the basic scone has been mastered it’s easy to change the flavours. Hello. I had some walnuts and dates in my cupboard so looked up a recipe and found yours! They turned out lovely although I had to substitute the mixed spice with cinnamon as I didn’t have any. Thank you, will make these again. I’m glad you enjoyed th3 scones, Vicky. Cinnamon was a good substitution, I’ll have to try it!